Welcome to Winter Storm 2019! Winter Storm is the UMD Language Science community’s yearly two-week series of seminars and workshops designed to foster research skills, stimulate new interdisciplinary research projects, and boost career growth and job readiness. These workshops are FREE and open to all language scientists, encompassing undergraduates, research assistants, grad students, postdocs, faculty members, and researchers at affiliated research institutes. Please register by January 4! This year we have a full slate of writing, research, professional development, methods, policy, and community-building. We are also very excited to welcome Laura Wagner (OSU Psychology) as an invited speaker on Wednesday, January 23. Her research examines language acquisition and intersects with many aspects of the research in our own community, including children’s acquisition of event semantics and their encoding of dialect and register to understand social indexical meanings. We also have a longstanding relationship with Laura because of her unique expertise in language science outreach efforts: she directs a research lab at the Columbus Center of Science and Industry in an innovative partnership that combines research with public education about language science. You can subscribe to our Google calendar here. Professional development - We will start each day with sessions designed to improve professional skills and discuss topics relevant to any language science career, including how to write letters of recommendation, support neurodivergent students in teaching and mentoring, reason about effect sizes and power, and decide whether or not to pre-register your research. Scientists are measured by the quality, frequency, and speed at which they publish. Hear from three speakers who have mastered the publication process by publishing large bodies of work and/or serving in editorial positions. We’ll address the most important aspects of publishing, and discuss how to efficiently navigate the process. ‘Cocoaloquium’ - We've heard that some language scientists feel they have to choose between Winter Storm and ‘getting their research done’ during the winter break. This year we are offering you a way to do both! Join us for two solid hours of writing time a day—you write your papers while we provide the cocoa, coffee, and peer pressure. On Day 3 (1/17), we'll open the Cocoaloquium with some tips about how to set effective writing goals and develop good writing habits from resident writing-group-expert Allie Johnson. On Day 4 (1/22) our resident yoga-expert Jan Edwards will offer her locally-acclaimed "Five-Minute Yoga For Grad Students" for those who want to begin their writing in a more calmed and focused frame of mind! lunch-without-talks - While great lunch talks are a staple of the LSC, sometimes standing in the lunch line together before a talk doesn’t feel like enough time to really get to know others in the community. This year we are trying lunch-without-talks during WS to allow more time for us to meet and catch up on research with each other. The one exception will be on Wednesday January 23, where we will host a lunch discussion with our invited speaker Laura Wagner about her unique approach to science communication and outreach. Research discussions - We have a number of research groups planned so far this year, but we would still welcome late additions! Anyone is welcome to attend these discussions, but if you plan to attend we ask that you email the contact person in advance so you can be in the loop on readings and so they can better plan the sessions. Policy discussions - This year we have reserved an afternoon block for interest groups to meet on issues of policy that relate to language science. Again anyone is welcome to attend these discussions. Both of the following groups will begin with a larger open meeting that will help to orient newcomers--Bias in Linguistics will do this on the first Tuesday, and Dialect Diversity will do this on the first Wednesday. 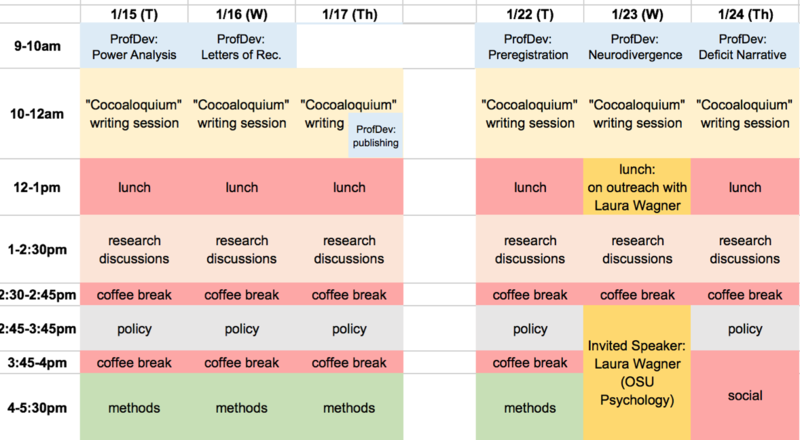 Methods - This year we have a multi-session statistics workshop scheduled, and parallel single-session workshops in Python and in several neuro analysis methods. Definitely email the contact person in advance so that you can make sure that you have any necessary software set up before the session!